See http://www.apop.com.au/news.html At first APop seemed to be the peak growth lobby developer body, with branches in all or most states, but the Property Council of Australia appears to have taken over the baton as the ultra peak body. However, APop is still in there with a fascinating cast of growth lobby stars with fingers in property development pies at all levels. I have attached a picture of the current APop front page, followed by some information about the industry backgrounds of Committee members. Note that there are quite strong links with the Scanlon Foundation which itself has strong links to ATSE and to the Multicultural Foundation of Australia and thence to most recent prime ministers and opposition leaders. APop in 2009 hosted Professor Andrew Markus, who "presented "Mapping Social Cohesion 2009: The Scanlon Foundation surveys". The presentation provided an overview of the Scanlon Foundation survey findings, with particular attention to change over the last two years and to the challenges facing maintenance of a large immigration program. " Michael Hickin botham, Vice President, Hickinbotham Group - South Australia's (SA), describes itself as "the largest and longest established building group in South Australia." 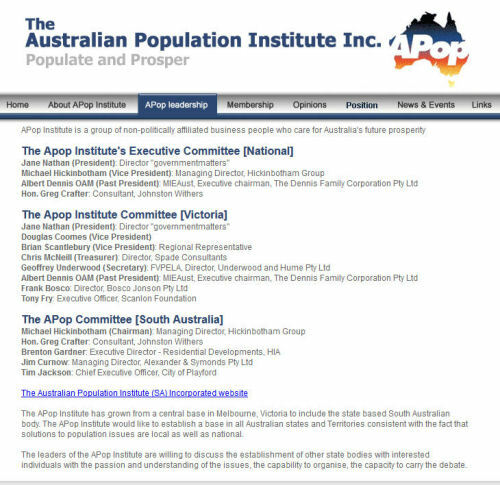 This information was yielded by investigating the business associations of the officials of Apop as listed on the Apop website and downloaded on 20/7/2001 from http://www.apop.com.au/people.htm. Additional information about business interests was obtained from the Business Who's Who of Australia, Dun and Bradstreet Marketing P/L, 35th Edition, 2001. Ibid.,"Five of the papers were delivered by university professors, two by PhDs, one by a Federal Cabinet Minister and one by a Shadow Cabinet Minister: impeccably qualified commentators, all - and none of them directly from the corporate sector that was hosting the event." Not only is the Australian Population Institute a front for the growthists' pushing their agenda, but "Sustainable" population fronts can also hide behind this increasingly meaningless word. It's become an oxymoron! There was a "Sustainable Population Forum" last Thursday, in High Street Thornbury. John Thwaites as a former Premier of Victoria, represented the Monash Sustainability Institute. Contradictorily to the name, he's an unashamed and unabashed pro-growth pusher! He's supporting of Melbourne's population boost to 8 million, and used all the stock and trade words of creating a sustainable city, with more people in apartments, and that we can "de-link" population growth from the impacts in the I=PAT equation! He claims water usage and green house gas emission have declined, despite population growth. He said we should welcome all the asylum seekers and embrace Asia to our heart! Despite the forum title, of "Sustainable" population, it was chaired by a team of pro-growth activists, unquestioningly linking economic growth population growth. There was nothing said about the folly of the desalination plant, the homeless, the crowding, the congestion, the loss of amenity and unemployment. One woman was a wildlife rescuer and she reminded the speakers of the horrendous carnage on our roads, and that carers get no funding, not even for the bullets to kill mortally injured kangaroo! Limits to our environmental resources, and species extinctions, were given scant regard. Lucinda Hartley gave some comforting words about our wonderful public spaces and urban designs, so we can all adapt happily to small apartments and have it endorsed as socially progressive and modern. The myth of Cornucopia is vibrant, and many organisations based presumably on "sustainability" are really hiding their growth agendas, fooling the public who are naive enough to believe that it's inevitable!